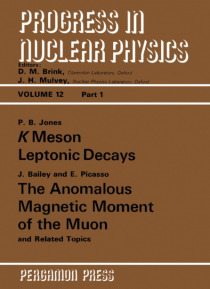 Progress in Nuclear Physics, Volume 12, Part 1: K Meson Leptonic Decay: The Anomalous Magnetic Moment of the Muon and Related Topics focuses on K Meson leptonic decay. The volume first discusses K Meson leptonic decay, including weak hadronic current, polarization of the muon, form of coupling, rate of partial decay, and density function of the Dalitz plot. The text then takes a look at the anomal… ous magnetic moment of the muon and other topics. The theory of the anomalous magnetic moment of electrons and muon and clock paradox, including muon and special relativity and lifetime of the muon in flight, are underscored. Experiments on the CERN muon storage ring and g-2 measurements are also explained. Numerical calculations and table representations showing the leptonic decay are then presented. The book is a dependable source of data for readers interested in the study of K Meson leptonic decay.